Have I mentioned yet just how much I love shopping only one time per week? It really is a game changer. I love knowing exactly what I’m going to buy (even though there’s a curve ball every now and then) and I love knowing exactly what I’m going to cook. It takes so much stress out of my life. 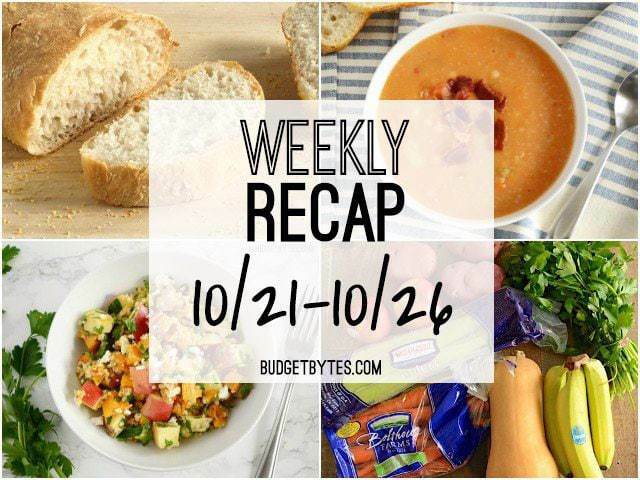 It really doesn’t take that much time to plan ahead and I’d rather sit down for a few minutes and plan ahead than to go out in cold nasty weather for another trip to the grocery store mid-week. Know what I’m sayin’? Hey look! I didn’t lose my bananas this week! :P Apples were finally on sale, so I grabbed a couple of those, as were butternut squash, and potatoes. I got more carrots and celery because I had soup on the menu again, and a bunch of parsley to fill out my autumn salad. I made a couple last minute switches to my grocery list once I got to the store. I planned to use pears in my salad, but apples were less expensive, so I went with that. I was going to use a fresh lemon for the salad dressing, but they were $0.80 each, so I decided to just use the bottled stuff I had sitting my fridge. Instead of using kale for my salad, I decided to use parsley because it was easier, cheaper, and if needed I could use it as a garnish in my soup photos (double duty!). I had peanut butter on my list because I’m out, but it wasn’t critical, so I listed it with a question mark to indicate that I’d get it if I had room in my budget once all the other items were collected. Turns out I did not have room for it this week. Ha! To go along with the soup, I made not just one, but TWO batches of this No-Knead Ciabatta ($0.42 recipe / $0.11 serving). 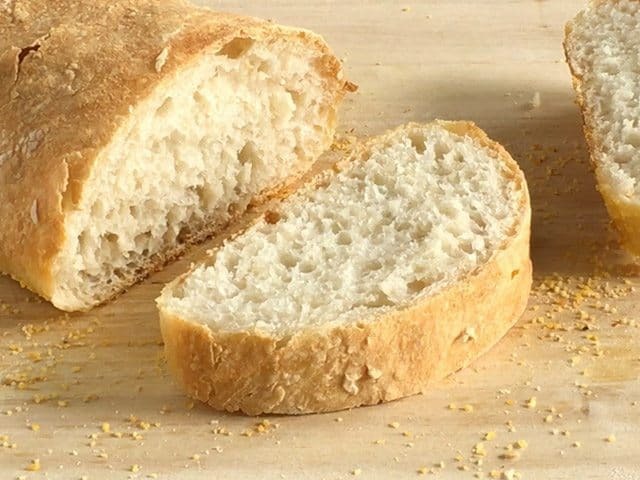 Making your own bread is a huge budget saver because a loaf like this is usually $3-$4 at the store—that’s almost 10x the homemade cost! This no-knead method is my favorite because it’s really easy and doesn’t require a lot of hand-on time. Click through the link to watch the video and see just how easy the process is. To get a little more freshness into the menu, I made this amazing Autumn Harvest Salad ($7.69 recipe / $1.28 serving). It combines roasted butternut squash, apples (or pears, if you’d like), bulgur and parsley for filler, a homemade honey lemon dressing, and a little feta for punch. Soooo good. 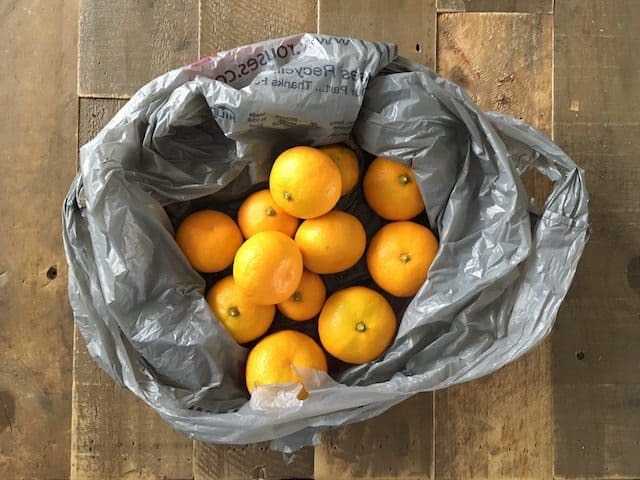 I was gifted a small bag of satsumas this week and I’m SO grateful for them. They are the tastiest little citrus babies I’ve ever eaten. They’re small, sweet, and super easy to peel. Satsuma trees in New Orleans produce a LOT of fruit, so this time of year people often bring bags of them into work and other places just to get rid of them all. I’m loving it! My go-to snack or savory breakfast is a fried egg in a tortilla, and for some reason I was really craving them this week. I ate too, too many. I went through that entire pack of tortillas and finished off the dozen eggs that I bought the week before. But hey, that’s why I keep that stuff on hand! Great filler. I ate out one time this week, but it was my birthday, so I don’t feel bad about that at all. And no, I won’t be telling you how old I am. I suppose maybe you could say I ate out twice because one day I did have a killer sushi craving, so I ran and picked up some so-so grocery store sushi… Cravings can be budget killers. I feel like I had a lot of leftovers this week. Lets start with the bananas. I’m not having the best luck with bananas lately. While the bananas at least made it home with me this week, they went straight from green to brown and I hate it when they do that. I only ate one, but made sure to freeze the rest for use in smoothies or banana muffins. I love frozen bananas in smoothies because it gives the smoothie a thick, ice cream-like texture. I usually use half a banana per smoothie, but I like to break that half into two smaller pieces because they fit in my blender better that way. 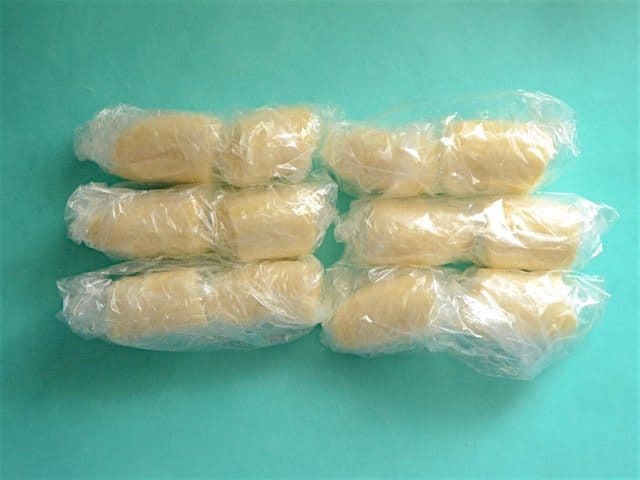 So, to freeze these bananas for smoothies, I broke each banana into four pieces, wrapped two pieces each into fold top sandwich bags, then tossed all the wrapped bananas into one quart sized freezer bag. That way I can just grab one half of banana at a time, unwrap it, and toss it into the blender. DONE. They do still get brown in the freezer, just at a much slower rate. They usually stay good for about two months for me. 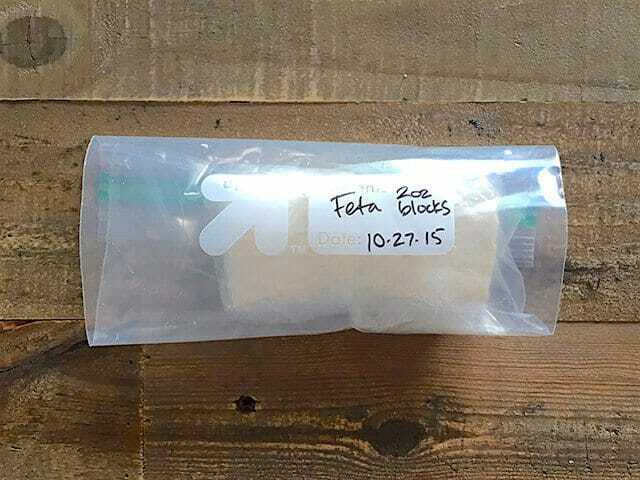 I did eat one little block of feta, but I still had a good 4 ounces that I froze for later use. I used a technique similar to the bananas, where I wrapped each 2oz. cube in a fold top sandwich bag, then put them both into a quart sized freezer bag. I usually use about 2oz. of feta per recipe, so I’ve got about two future recipes worth of feta on hand. Cheese freezes really well, but it tends to be a bit more crumbly upon thawing. With feta, which I usually crumble anyway, it’s not an issue. I also had some leftover carrots and celery from the soup. I usually chop them up and freeze them for my next batch of soup, but I did get a bit lazy with that this week. Instead, I’m going to make more carrot sticks to snack on because I really enjoyed that and I think I can use the celery in one of the dishes I have planned for the coming week. Lastly, I wasn’t able to eat all of my Autumn Harvest Salad, before the end of the week or before it got a bit soggy, so some of that went in the trash. 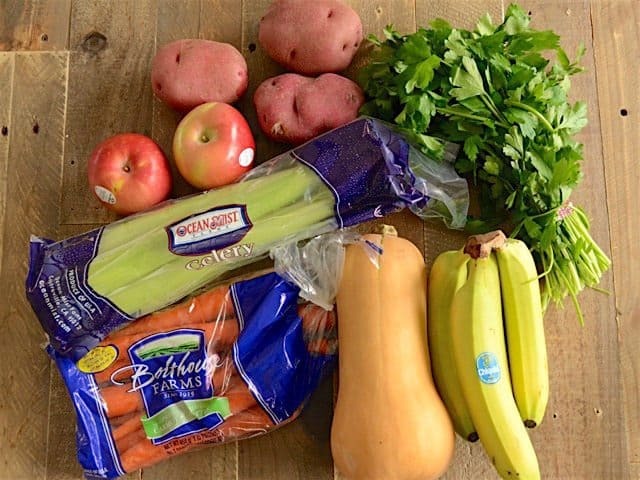 Overall, I think I’m still really low on the food waste scale, so I’m not going to feel too bad about that one! This week went very smoothly and I felt well fed! 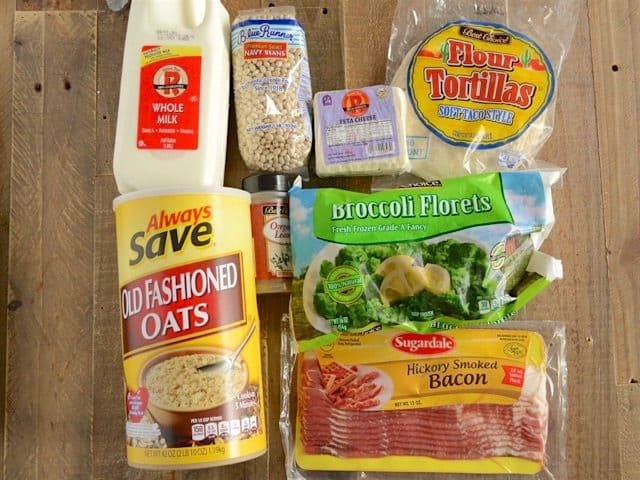 I loved the variety I had and was happy that I was able to save most of my leftovers in the freezer. I’m getting into a rhythm of making 2-3 new recipes per week plus one old recipe from my archives, which I update with great new photos and any tweaks to the recipe that I feel necessary. Because the old recipe will live in the archives at it’s original date, make sure you follow on social media so you can see when and what recipes I’m breathing new life into. I’ll always post pictures and links to the old recipes that I remake, but they won’t show up on the front page of the website. Follow me on: Facebook, Twitter, Pinterest, and Instagram to never miss an update! Oh yeah, and catch me on Youtube to see recipes in action! Eggs in tortillas (and oatmeal!) are my breakfast go-tos also! I like to make a batch of quinoa and freeze it in smallish portions, then I pull one out and add that to my egg taco! I buy local organic eggs so I try to just eat one a day since they are $5/doz. But I love that I get them from my neighbors and they are so so tasty. Another way to keep bananas longer is to refrigerate them once they get as ripe as you like them. The peels will turn brown in the fridge but the inside won’t ripen further. I don’t like eating cold bananas out of hand but they’re fine in oatmeal or cereal. Or you could plan a little ahead and let them come back to room temperature before eating. 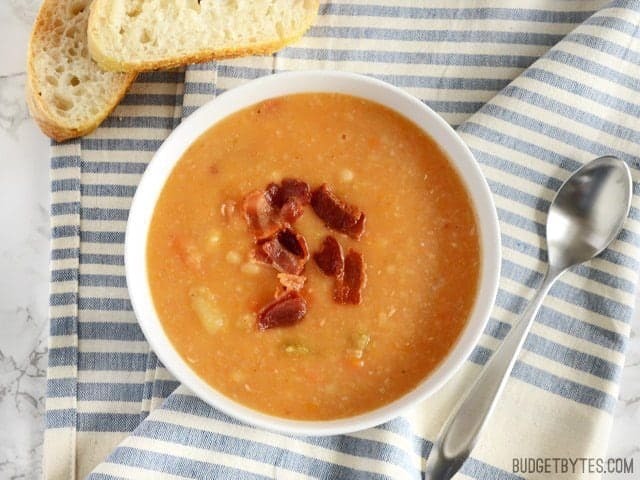 I’ve tried lots of your recipes and liked every one. Dragon noodles are a special favorite. 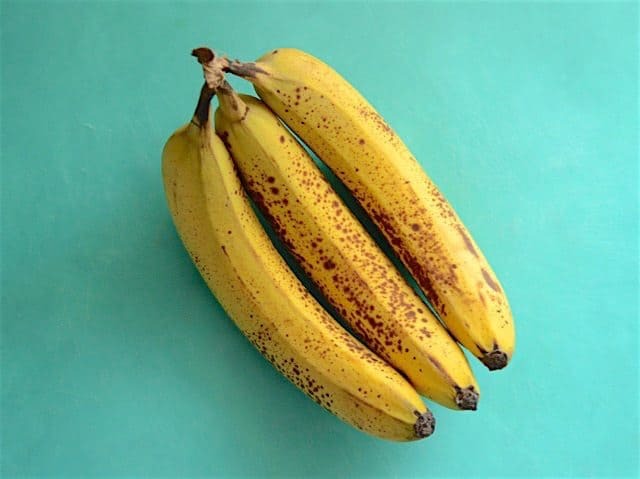 You can store ripe bananas in the refrigerator for a few days to keep them from getting overripe too fast. The skins will brown, but the fruit will be fine. How about a Satsuma-banana smoothie? I don’t have a recipe to share because left to my own devices, I mostly just toss together ingredients that sound like they will work together. 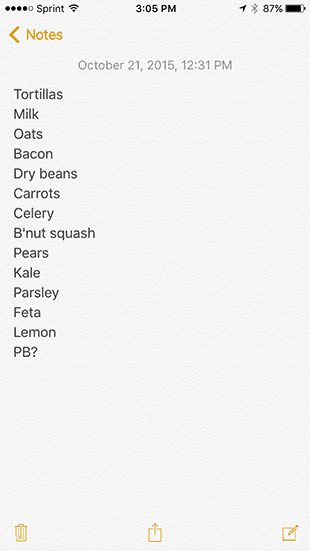 I’m glad I’m not the only one who uses question marks in her grocery lists, lol.